“This is a labor of love, it’s dirty, it’s sweaty and it’s so rewarding,” E.J. Simmons a store manager at the Humane Society of St. Thomas said. Simmons has been volunteering at the Humane Society for the past decade. She has helped take care of and foster animals like they’re her own. Now she’s getting ready to send two of her foster pups off to their new home on the mainland. “I’m crying already and I’ll be crying even more when I get to the airport, but this is their chance to get a home and you want to keep everyone. But it is important, and I want to stress to everybody please foster,” Simmons added. The Humane Society of St. Thomas is always full of animals. But since last years’ hurricanes they have been overwhelmed with unwanted pets. That’s where Pet’s with Wings comes in. 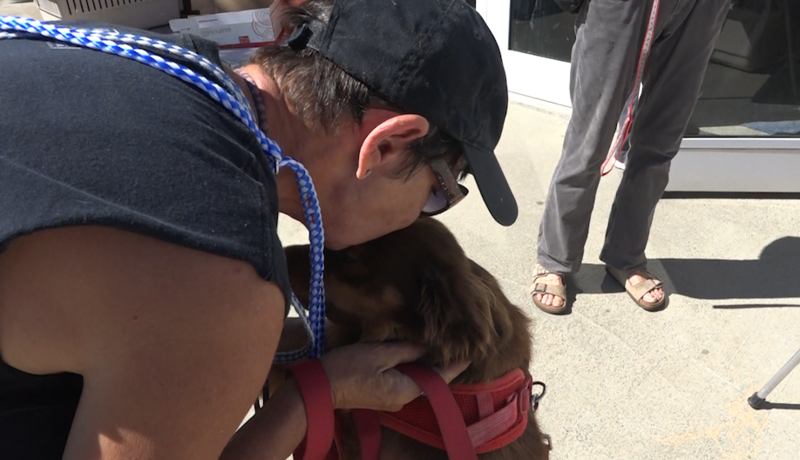 It’s a Humane Society program that transports these four-legged friends to rescue groups and shelters on the mainland where there is a shortage of adoptable animals. But the reality for workers at the Humane Society of St. Thoma is that even after this trip, they’ll still be over capacity. It’s a reality people like Rhea Vasconcellos are faced with every day. “We got 75 dogs in, in one month. And it’s just unbelievable. I have been working with the shelter now for almost 7 years and I’ve never had this many animals in house,” Vasconcellos the Humane Society of St. Thomas Program Manager said. That’s why she stressed the importance of having your pets spayed and neutered. It is the one message she has for islanders to help control the pet population on Island. She expressed her gratitude to programs like Pets with Wings. Without them, she said she would be faced with an incredibly difficult decision. For more information on the Pets With Wings Program you can call Rhea at 340.643.0796 or go to Pets With Wings on Facebook.